Deepen your sense of the past at sights like Chateau Beauregard and Chateau Lamothe-Bergeron. Get a sense of the local culture at Chateau Malrome and Chateau tour Castillon. You'll find plenty of places to visit near Bordeaux: Chateau d'Yquem (in Sauternes), Saint-Emilion (Monolithic Church of Saint-Emilion & Artisans Createurs a St Emilion) and Chateau St. Christoly (in Saint-Christoly-Medoc). There's more to do: pick up a one of a kind souvenir at Atelier-Brocante de la Minoterie and contemplate in the serene atmosphere at St. Andre Cathedral (Cathedrale Saint-Andre). To see traveler tips, ratings, maps, and more tourist information, read our Bordeaux holiday tool . Minneapolis, USA to Bordeaux is an approximately 15-hour flight. Traveling from Minneapolis to Bordeaux, you'll lose 7 hours due to the time zone difference. In April, Bordeaux is a bit warmer than Minneapolis - with highs of 64°F and lows of 46°F. Wrap up your sightseeing on the 22nd (Mon) to allow time to drive to Castelnaud-la-Chapelle. Step off the beaten path and head to Musee du Machinisme Agricole et Automobile and Bastide Royale de Villerealais. Give yourself a bit of retail therapy at Les Gourmandises de Lucco and Issigeac Sunday Market. You'll find plenty of places to visit near Castelnaud-la-Chapelle: Chateau de Gavaudun (in Gavaudun), Eglise Notre-Dame de Villereal (in Villereal) and Musee Murat (in Labastide-Murat). To see maps, photos, other places to visit, and other tourist information, refer to the Castelnaud-la-Chapelle trip app . Getting from Bordeaux to Castelnaud-la-Chapelle by car takes about 2.5 hours. Other options: take a train; or take a bus. Expect a daytime high around 65°F in April, and nighttime lows around 43°F. Wrap up your sightseeing on the 25th (Thu) to allow time to drive to Arles. Remote, uneventful, but definitely not a waste of time, Arles is absolutely steeped in Provençal culture. Kick off your visit on the 26th (Fri): identify plant and animal life at Le Parc Ornithologique de Pont de Gau, admire the masterpieces at Musee Departemental Arles Antique, explore the ancient world of Amphitheatre (les Arenes), then take in the exciting artwork at Anne Clergue Galerie, then get a taste of the local shopping with Galerie Insideout, and finally contemplate in the serene atmosphere at Eglise St-Trophime. To see where to stay, other places to visit, photos, and other tourist information, read our Arles travel itinerary planner. Drive from Castelnaud-la-Chapelle to Arles in 5.5 hours. Alternatively, you can fly; or take a train. In April in Arles, expect temperatures between 66°F during the day and 48°F at night. Wrap up your sightseeing on the 26th (Fri) to allow time to take a train to Paris. Eschew the tourist crowds and head to German Cemetery Belleau and Cimetiere Americain Aisne-Marne. Get some historical perspective at Aisne-Marne Memorial & Cemetery and Rue du Gros-Horloge. 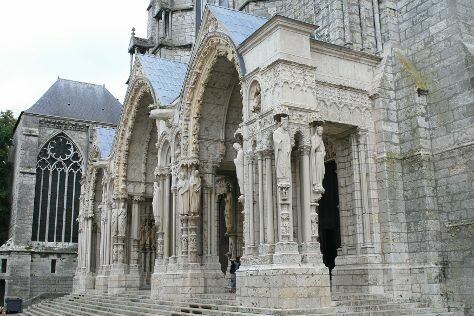 Change things up with these side-trips from Paris: Basilique de Saint-Mathurin (in Larchant), Chartres Cathedral (in Chartres) and Cathedrale Notre-Dame de Rouen (in Rouen). Next up on the itinerary: explore the historical opulence of Chateau de Fontainebleau. To find ratings, maps, photos, and other tourist information, use the Paris trip itinerary builder site . Getting from Arles to Paris by train takes about 4 hours. Other options: fly; or drive. Expect little chillier temperatures when traveling from Arles in April; daily highs in Paris reach 60°F and lows reach 42°F. Finish your sightseeing early on the 30th (Tue) to allow enough time to travel back home.